As the years 2010-2011 will be very „moroccan” to our team we decided to spend the symbolic New Year`s Eve and the first days of 2010 in this beautiful country. Of course that was not the only reason of this trip – we combined the holidays with the exploration of new localities and finds. As usual we landed in Marrakech where we spent the first day of our trip taking great delight in the atmosphere of the Djemaa el Fna square. 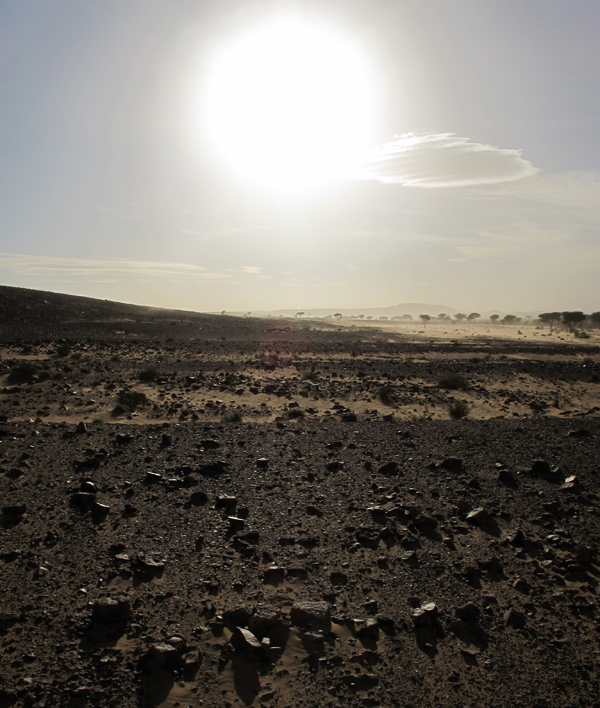 From there we sett of directly to the Bou Azzer region through the high Atlas – there as we mentioned in our last report from Morocco (XI 2009) quite a lot of new interesting specimens have been found recently. As we expected the find of very fine skutterudites from Bouismas have exhausted. 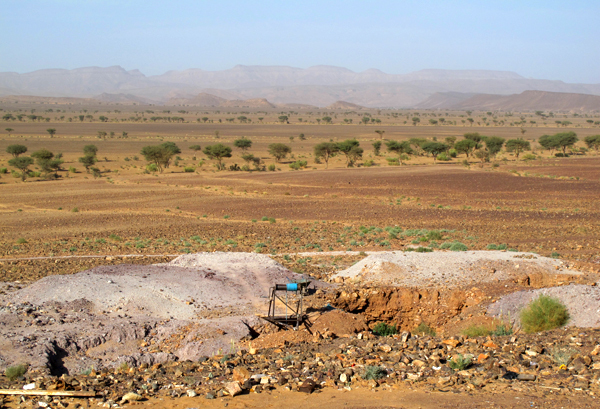 However quite big amounts of the minerals of silver (mainly dyscrasites) are still being collected in the same mine. 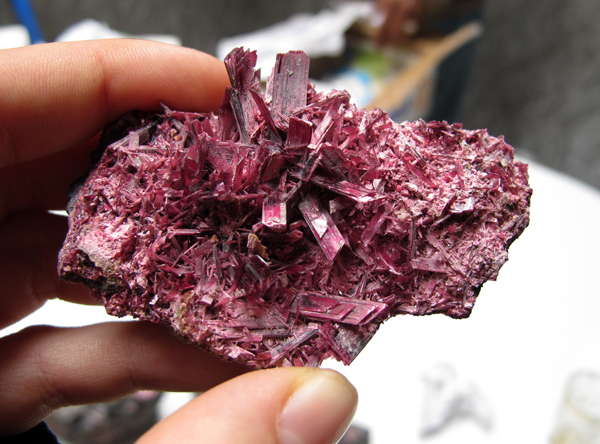 The new, not less interesting finds are erythrites of very good quality. The Bou Azzer region is famous for this mineral worldwide, although almost no very good specimens have been found there for many years. At the end of 2009 the oldest mine shaft (Shaft 1) in this region was opened after many years of stoppage. 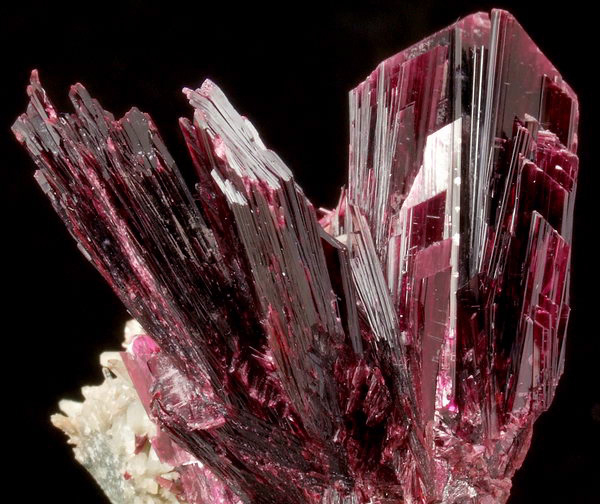 During the working on the level 50 m numerous pockets with excellent erythrite crystals – formed as blades as well as needle-like shaped crystals. Their size reaches up to even 6-7 cm! Some of them are of very intensive purple color and are very gemmy. 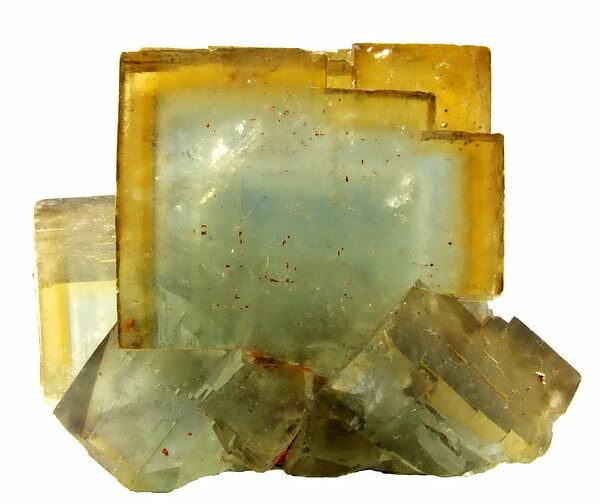 The best quality specimens are usually built of crystals which size reaches up to 1-1,5 cm. 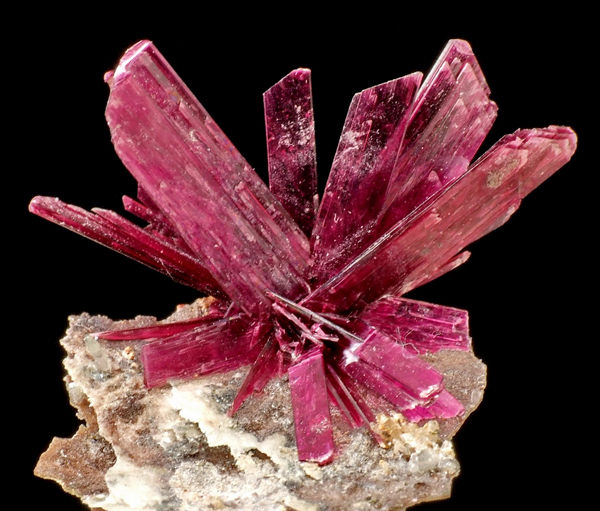 Some occur also in paragenesis with roselite. 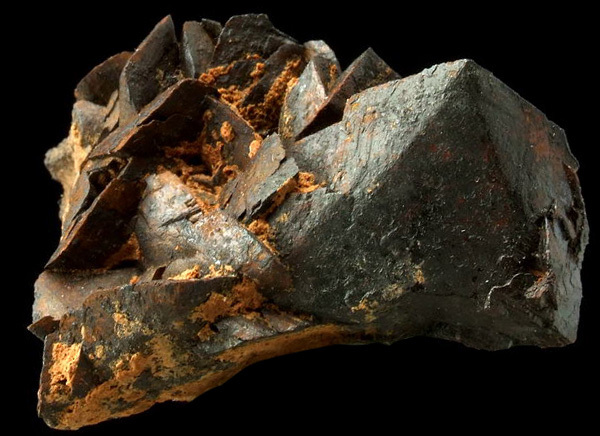 Unfortunately majority of the specimens of this very fragile mineral is damaged because of explosives usage and not careful extraction. 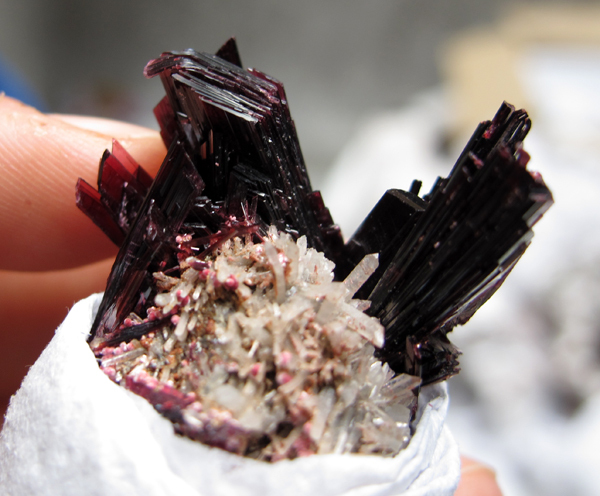 During this short time a few hounders of erythrite specimens were collected. Currently the works of drilling the shaft to the level 70 m are in progress. According to the miners we should not expect any good specimens on this level – only the level 50 is well known in the area for the best specimens. After a short stay in Bou Azzer region we went to the area of Alnif where we spent some time penetrating opened and closed copper mines, from where the azurites and malachites come from. 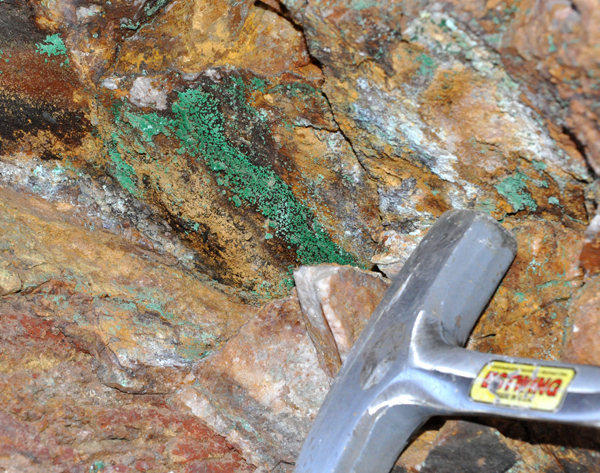 We managed to find a few pockets with probably brochantite or malachite. As the most of localities given by the dealers for the specimens that come from there are incorrect, some more informations on this area will be published soon. During the exploration of this region we found also some not known before quartz-siderite veins from which we managed to collect some specimens with siderite crystals up to 3-4 cm big. We will come back for sure to do some more precise research there. We spent the New Years Eve in a familiar atmosphere with our friend Ben in Mecissi drinking Polish vodka, Moroccan bier and orange juice. 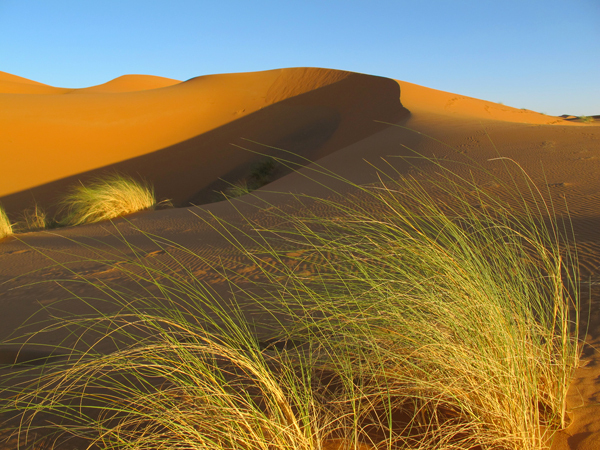 We spent the next day in the region of Erfoud delighting in the views of sandy dunes and oasis. We also visited some local workshops with fossils. 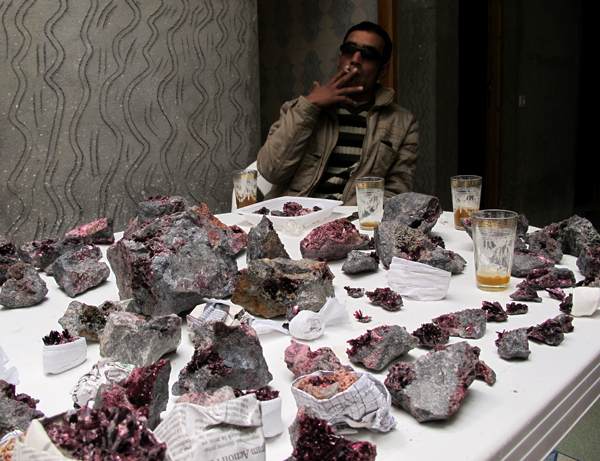 Apart from that we managed to buy a big lot of new vanadinites from Taouz. 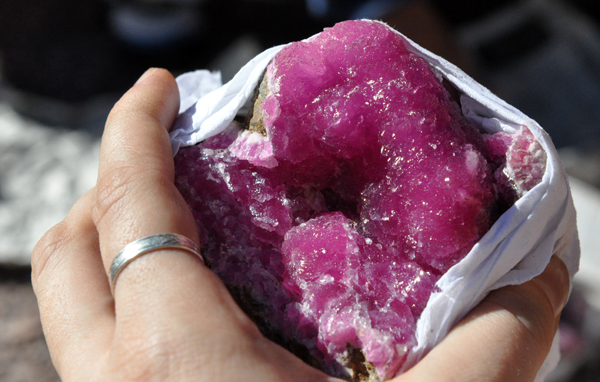 The crystals from the new find reach quite big sizes – to 5 cm. 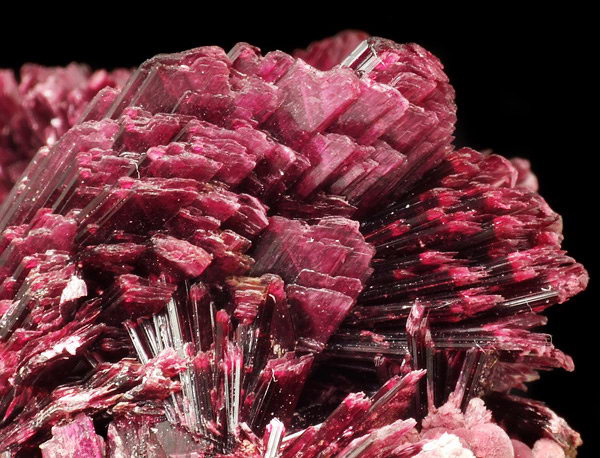 The majority of them range in color from yellow to red, often changing the color within one crystal. There are a lot of specimens formed as groups of partly skeletal crystals. As the weather was exceptionally good and there was no snow in the highest parts of the High Atlas, we changed our original plans and crossing only Jorf (where we acquired some fluorites) and a picturesque Todra ravine we arrived to Imilchil. 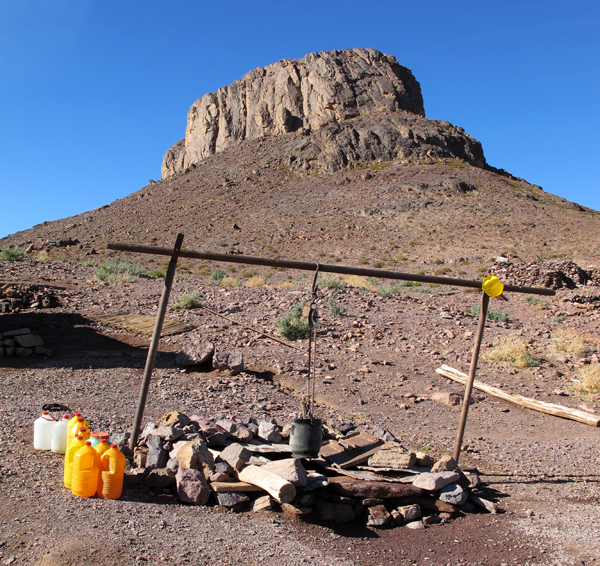 We had there a great time exploring the outcrops of intrusive rocks situated at quite big heights (over 2600 m). 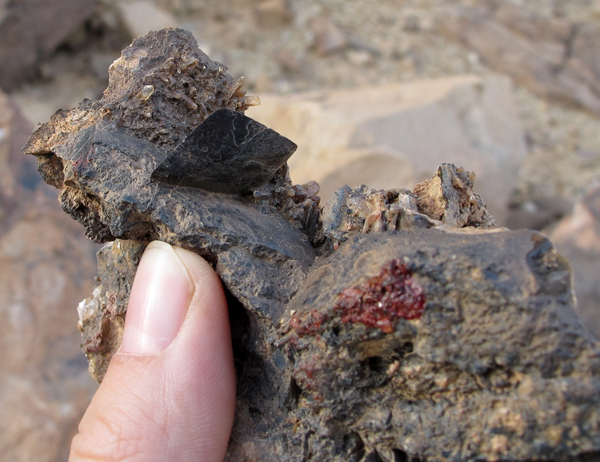 During this research we found some magnetite specimens, and single apatites and zircons. 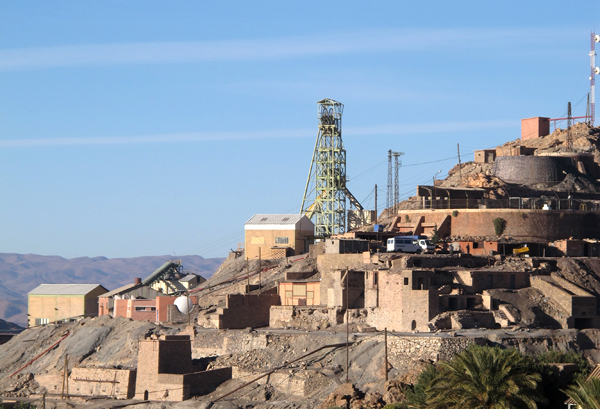 From Imilchil we set off to the north – to the region of Midelt, where apart from the visit in a lot of mineral shops we made a trip to the mining area of Aouli. 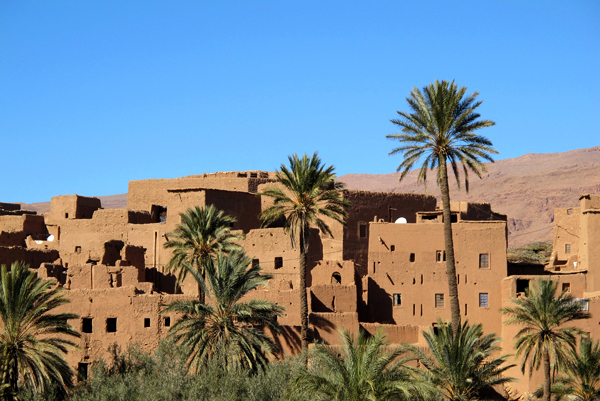 As many other moroccan localities also this one is given incorrectly as the source of fluorites, minerals of copper and agates. 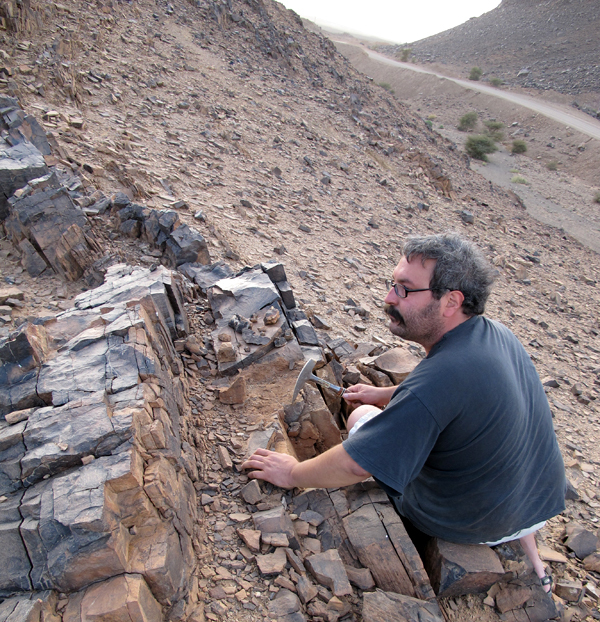 Actually there are almost no specimens found in Aouli. 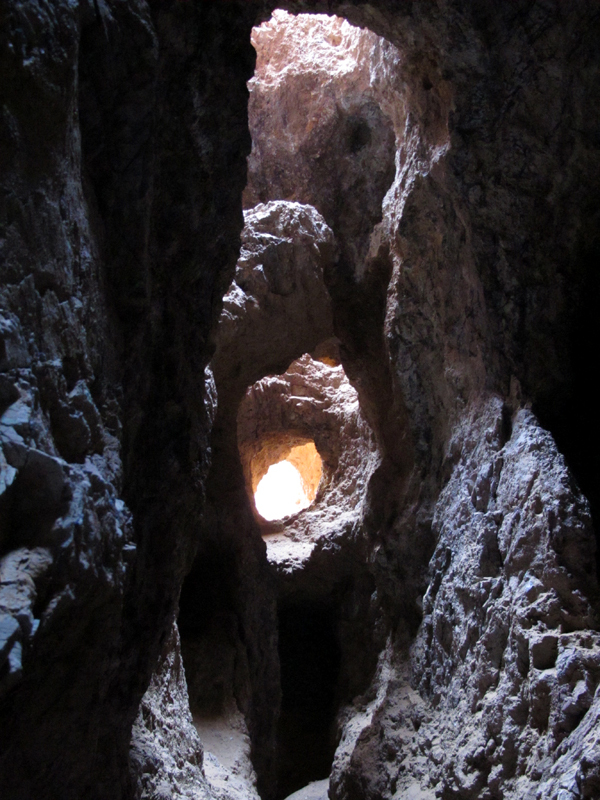 However that does not change the fact that the old mine constructions and buildings, shafts etc situated in severe mountainous ravine are very impressive! Thanks to a co-incidence we arrived to the last locality on our trip – Kerrouchene in the middle of the night (it was the same last time). What is more because of the rain the roads changed into muddy pools and we dug the car for over an hour in a thick mud. Fortunately we managed to solve this problem quite fast thanks to our experience of digging out the cars on Madagascar. 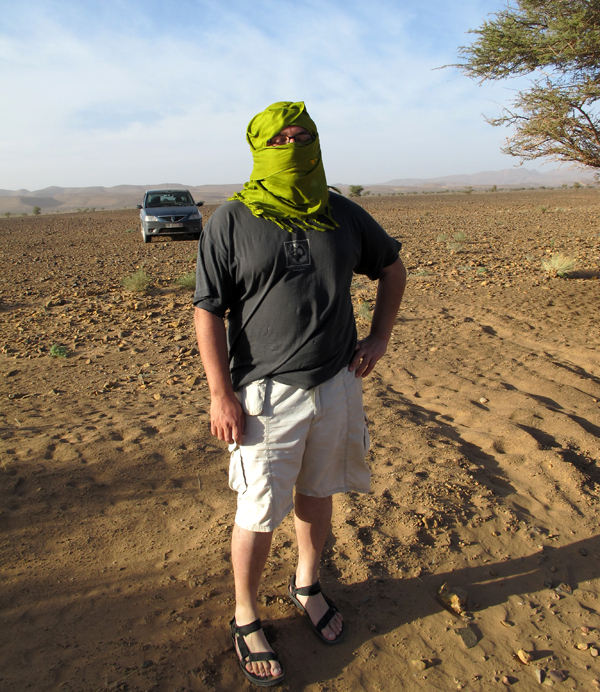 At the last day of the trip we returned to Marrakech from where we took a plane to cold Poland, where snow and -10C greeted us … We are already thinking of the next expeditions – we are planning to go to India in March and to Madagascar. See erytrites from Bou Azzer in our store. See vanadinites from Taouz in our store. See skutterudites from Bou Azzer in our store. 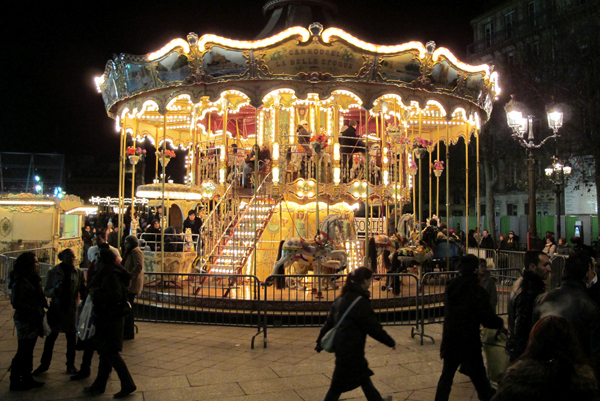 Carousel in Paris, on the way to Morocco. Fot. J. Gajowniczek. 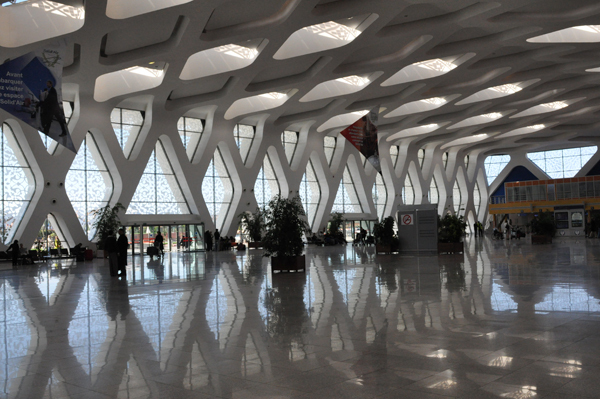 Airport in Marrakech. Fot. J. Gajowniczek. 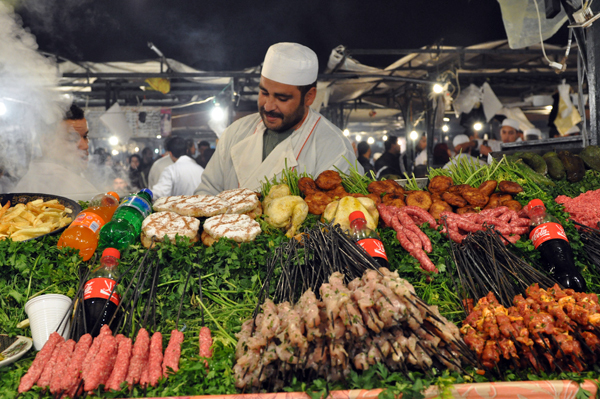 One of the numerous eating places that are "fold-out" every evening on the Djemaa el Fna square in Marrakech. Fot. J. Gajowniczek. 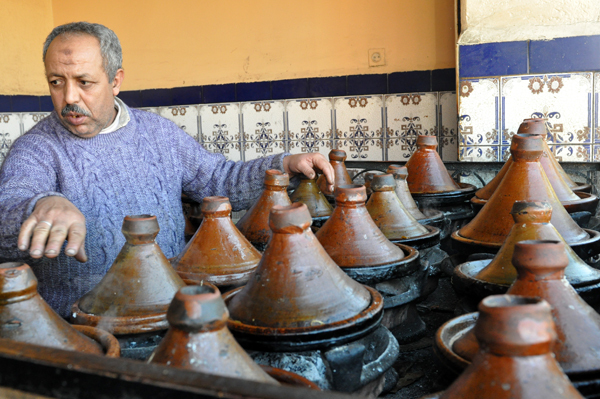 Boiling tajines waiting for hungry turists in Marrakech. Fot. J. Gajowniczek. 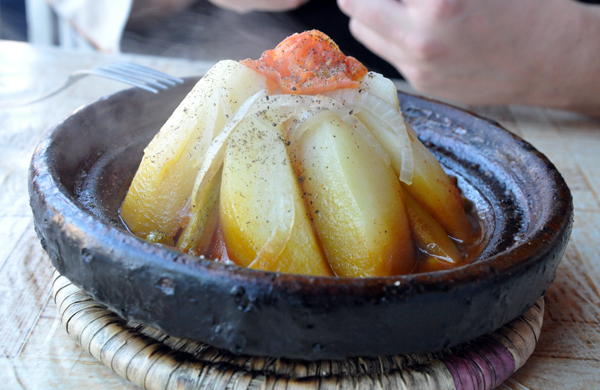 Tajine - a typical Moroccan dish. Fot. J. Gajowniczek. 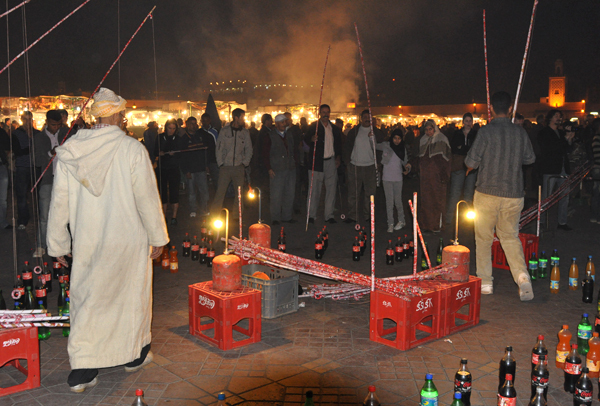 Peope fishing for bottles on the Djemaa el Fna square in Marrakech - if you hunt down Coke or Sprite it is yours. Fot. J. Gajowniczek. 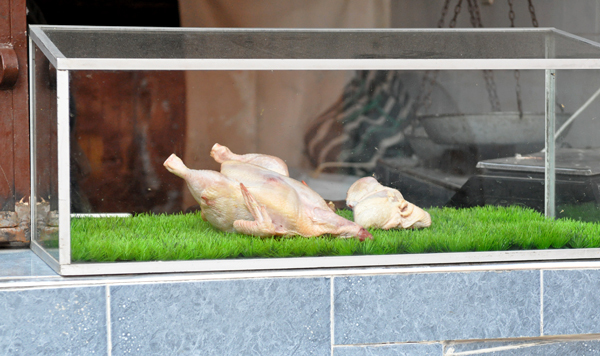 Headless chickens laying on plastic grass - an interesting window of butcher`s shop in Marrakech. Fot. J. Gajowniczek. 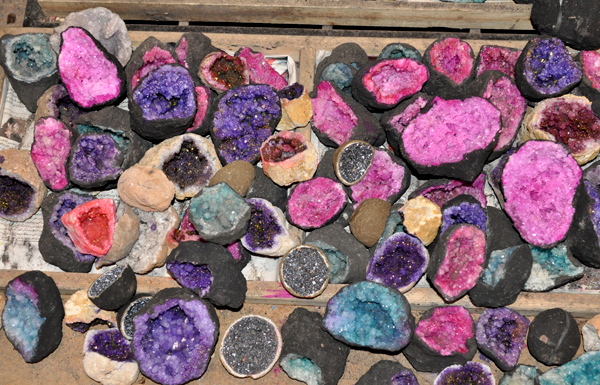 Very colorful and very fake geodes at the market in Marrakech. Fot. J. Gajowniczek. 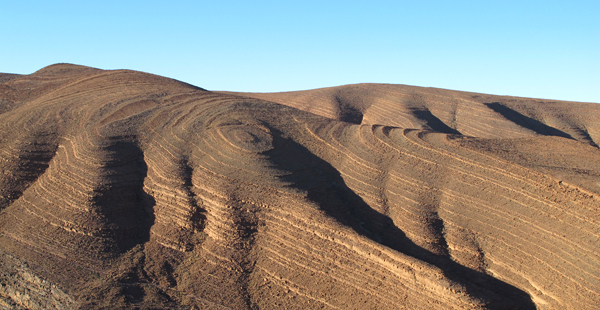 Beautiful pattern of eroded layers on the way to Ouarzazat. Fot. J. Gajowniczek. 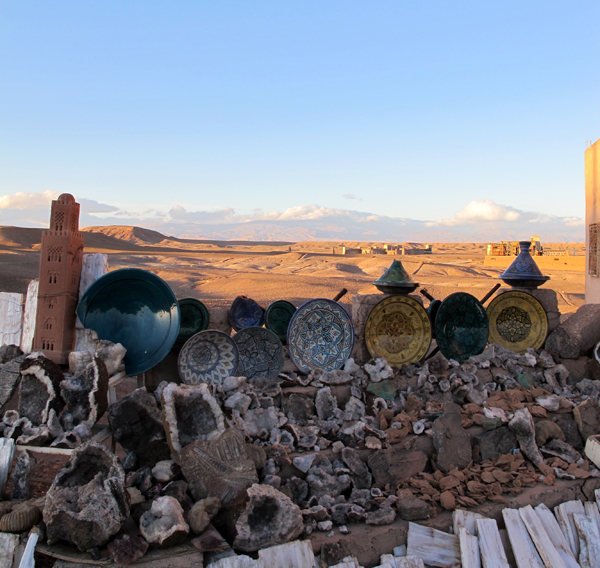 Souvenir and mineral shop in Ouarzazat. 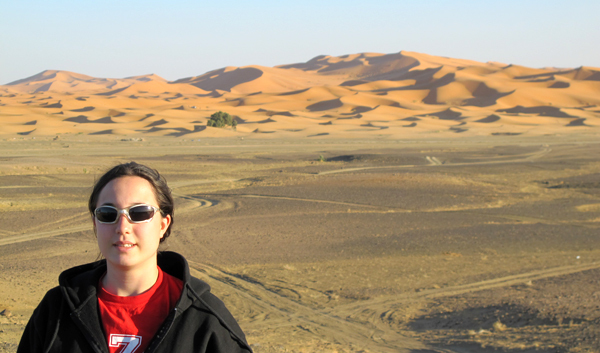 The desert and Hight Atlas in the background. Fot. J. Gajowniczek. 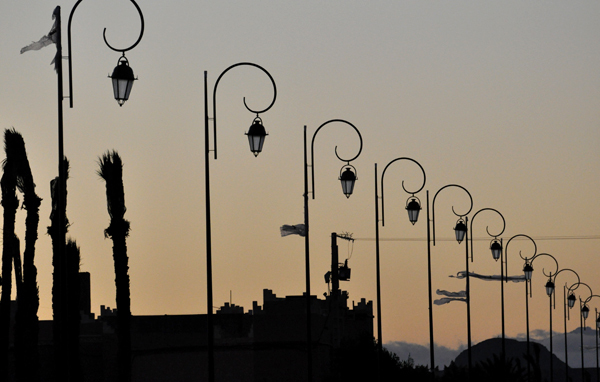 Brand new street lamps in Ouarzazat, there are houndreds put up recentely, but none of them works. Fot. J. Gajowniczek. 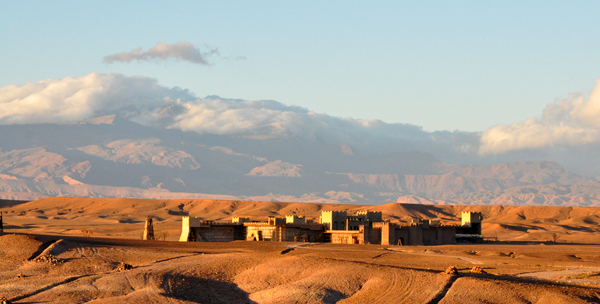 Ouarzazat hosts the largest movie studios in the world - Atlas studios. Several historical movies were shot on those there, including Asterix & Obelix, Cleopatra, Gladiator and lately Alexander, Kingdom of Heaven and Babel. One of the first movies shot there were the Stars Wars. Fot. J. Gajowniczek. 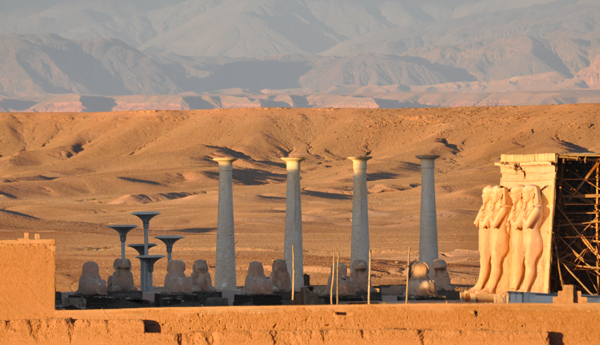 Ouarzazat hosts the largest movie studios in the world - Atlas studios. Several historical movies were shot on those there, including Asterix & Obelix, Cleopatra, Gladiator, and lately Alexander, Kingdom of Heaven and Babel. One of the first movies shot there were the Stars Wars. Fot. J. Gajowniczek. New geothite geode from Imini, near Ouarzazate, size 8 cm. Fot. G. Bijak. New geothite geode from Imini, near Ouarzazate, size 8.3 cm. Fot. G. Bijak. 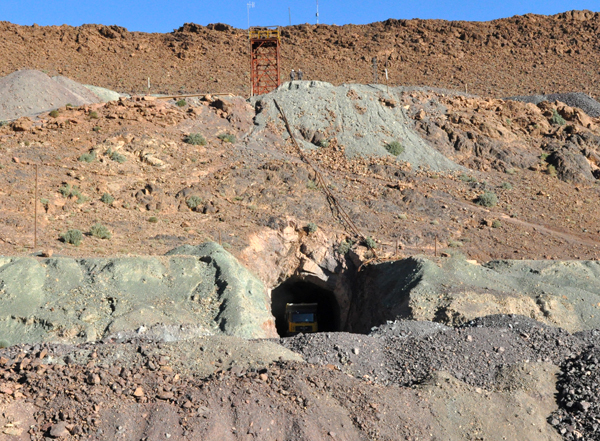 Aghbar Mine. Fot. J. Gajowniczek. Aghbar Mine and the dumps. Fot. J. Gajowniczek. Buismass Mine. Fot. J. Gajowniczek. 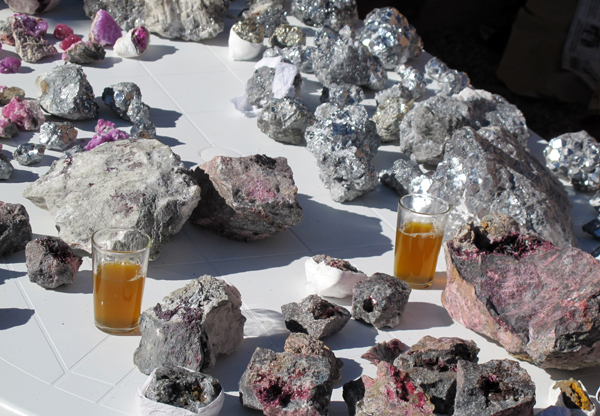 Skutterudites, Erithites and extremely sweet Moroccan tea. Fot. J. Gajowniczek. 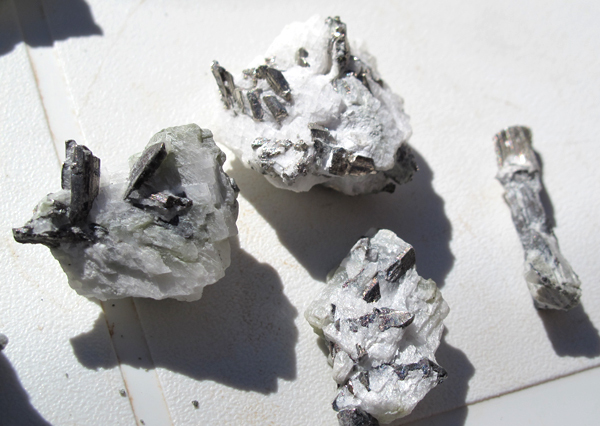 Dyscrasite specimens are still being collected in the Buismass mine. Fot. J. Gajowniczek. Well, Bou Azzer region. Fot. J. Gajowniczek. 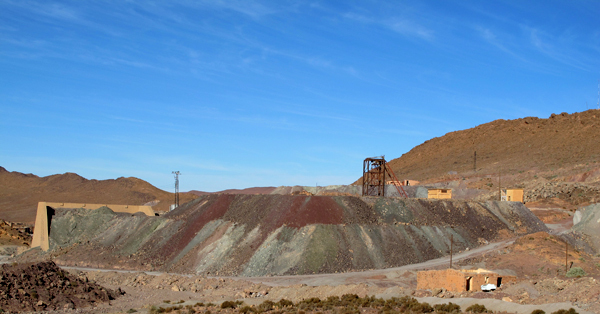 Bou Azzer mine. Fot. J. Gajowniczek. Erithrite Boss. The new find of very fine specimens (from the shaft 1) and of course some tea. Fot. J. Gajowniczek. Erithrite from the new find. Fot. J. Gajowniczek. 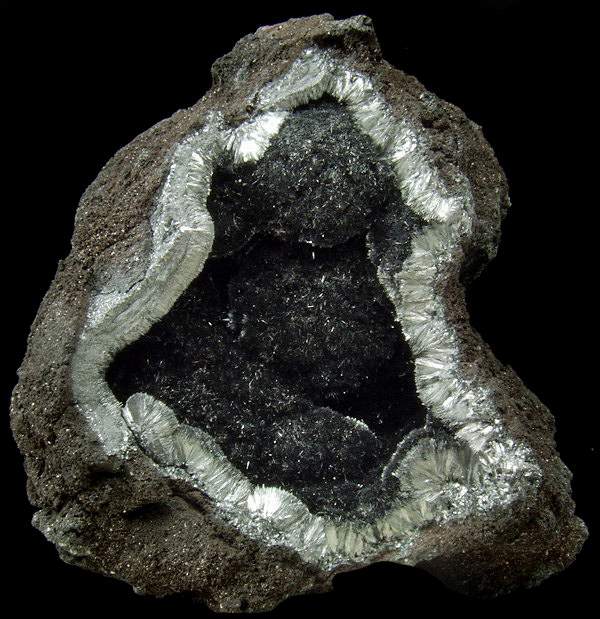 Erithrite from the new find; size of crystals up to 2.6 cm. Fot. G. Bijak. 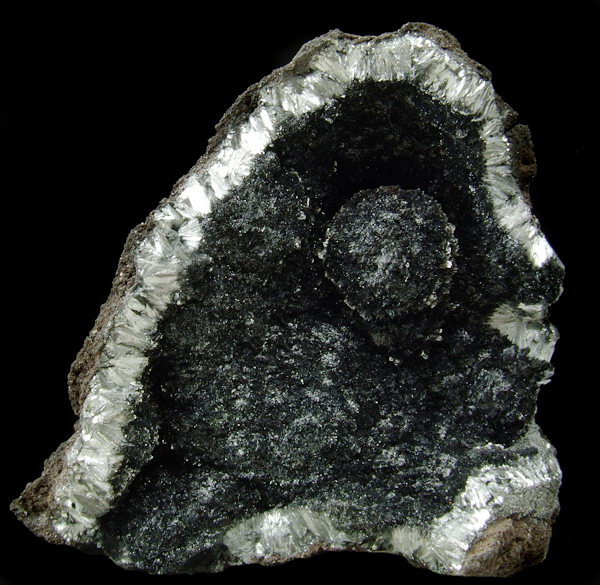 Erithrite from the new find; field view 1.6 cm. Fot. G. Bijak. Erithrite from the new find; size 2 cm. Fot. G. Bijak. 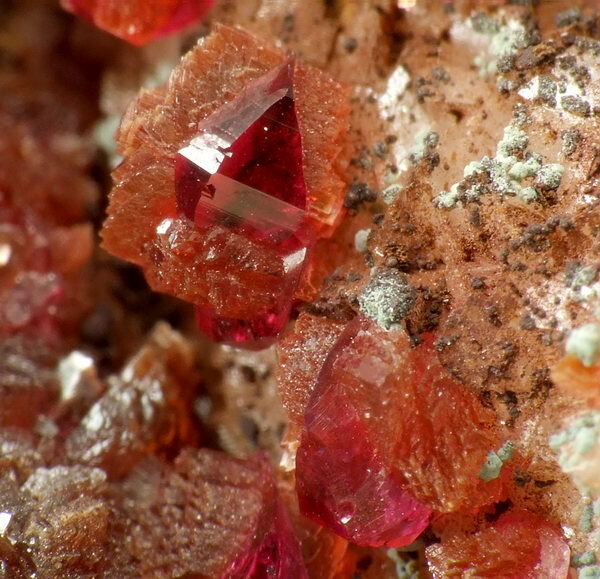 Epitactic growth of Roselite and Roselite beta; crystals size up tu 3 mm. Fot. G. Bijak. 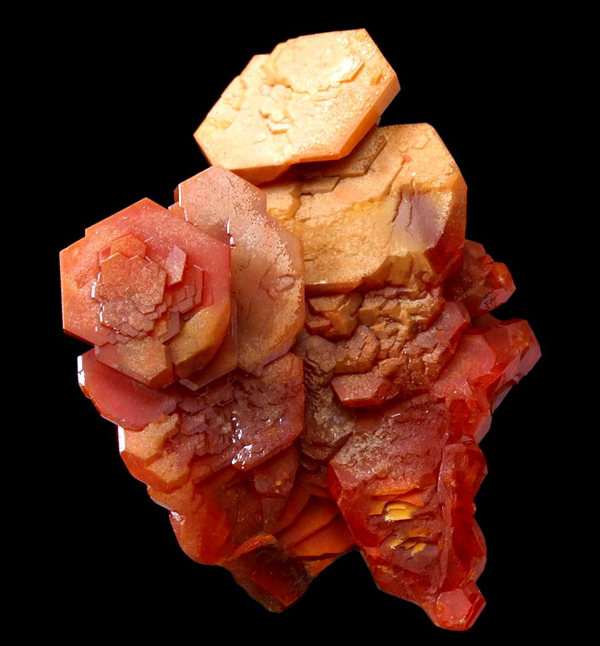 Cobaltocalcite from Bou Azzer. Fot. J. Gajowniczek. 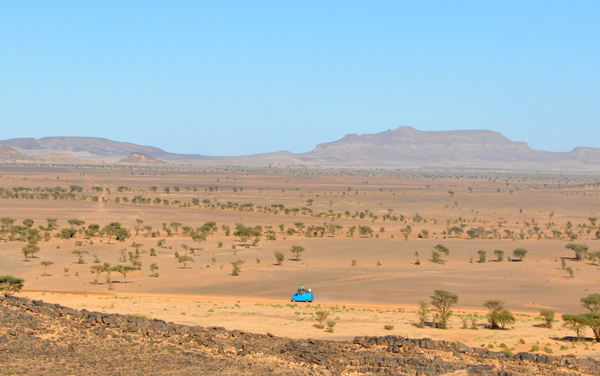 Krzysztof, Tomek and our car on the desert. Fot. J. Gajowniczek. View to the desert from the top of the hills above the Oumjrane copper mine . Fot. J. Gajowniczek. 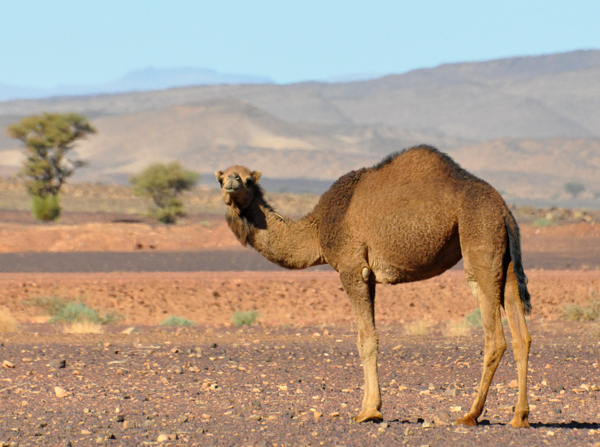 Camel on the desert. Fot. J. Gajowniczek. 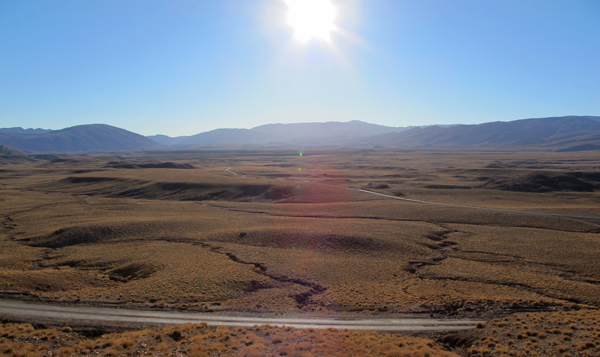 View to the desert from the top of the hills above the Oumjrane copper mine (old mine buildings visible). Fot. J. Gajowniczek. Tomek and Krzysztof in the Oumjrane quarry. Fot. J. Gajowniczek. 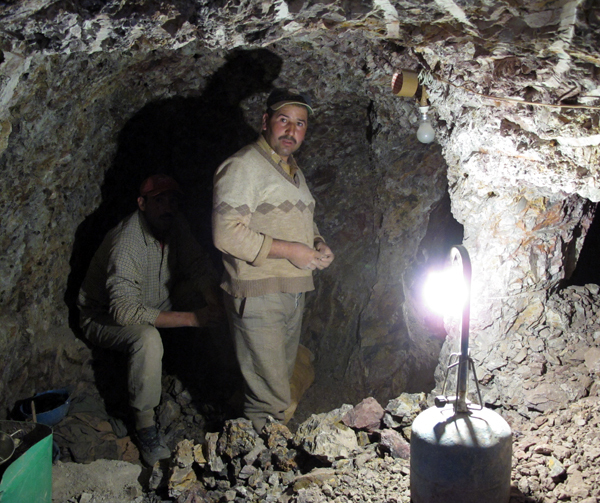 Tomek and Krzysztof in the Oumjrane quarry, extracting some Malachite specimens. Probably Malachite or Brochantite Fot. J. Gajowniczek. 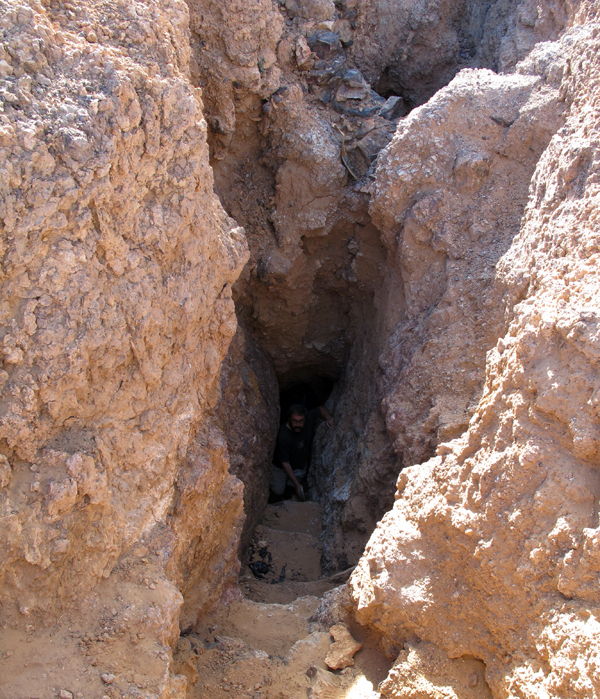 The copper-lead vein in Oumjrane. Fot. J. Gajowniczek. Underground workings in Oumjrane. Fot. J. Gajowniczek. 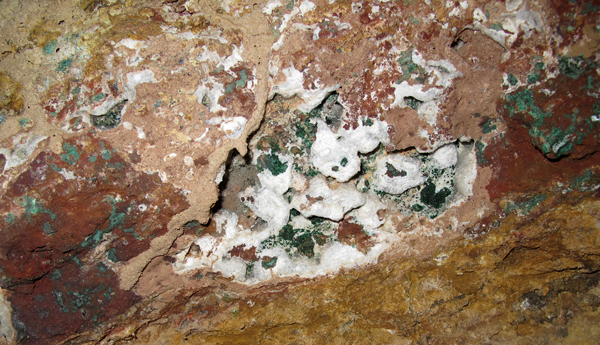 Malachite in the underground workings in Oumjrane mine. Fot. J. Gajowniczek. 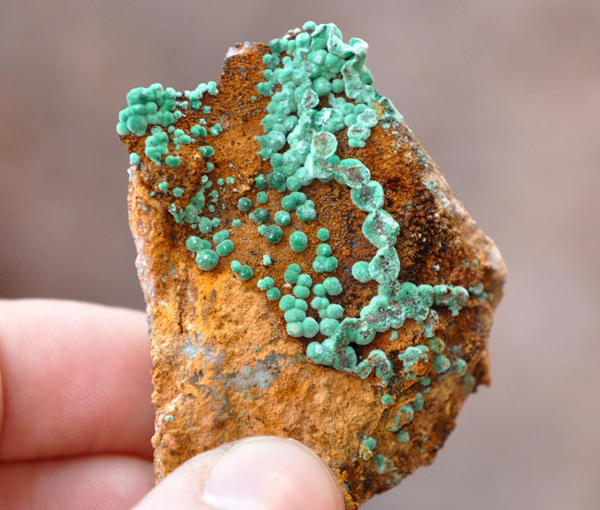 Colecting and packing Malachite/Brochantite specimens. Toilet paper is extremely useful, we had a whole trunk of it. Fot. J. Gajowniczek. 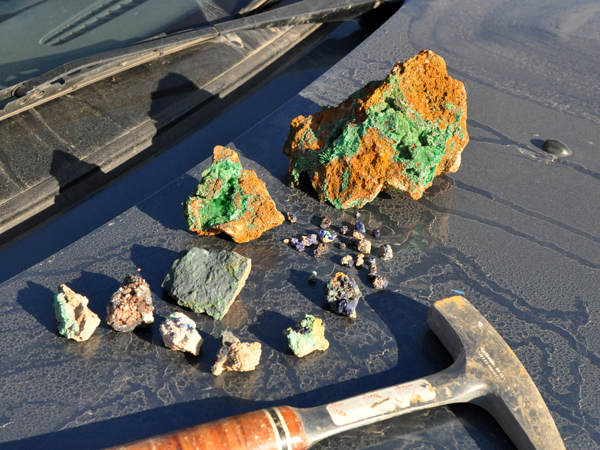 Specimens of Azurite and Malachite/Brochantite self collected in Oumjrane. Fot. J. Gajowniczek. 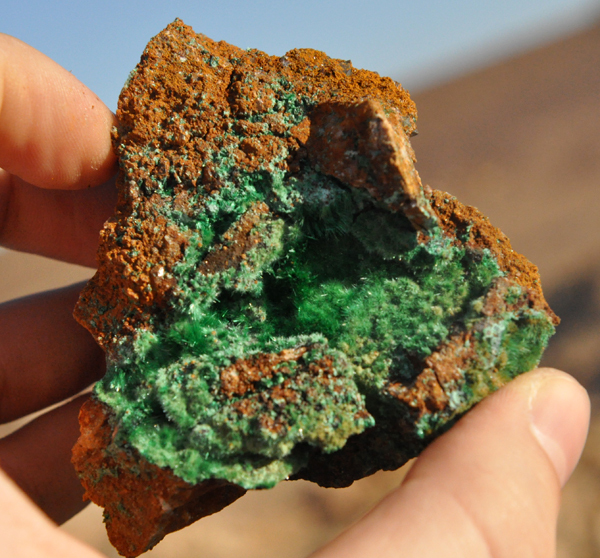 Malachite/Brochantite specimens from Oumjrane. Fot. J. Gajowniczek. 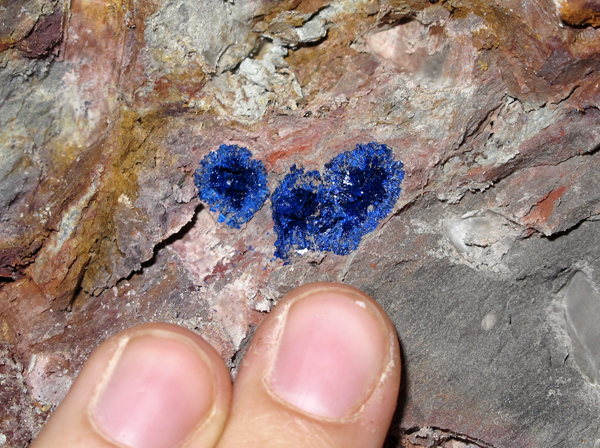 Azurite from Oumjrane; size 1.6 cm. Fot. G. Bijak. Azurite from Oumjrane; size 4.2 cm. Fot. G. Bijak. 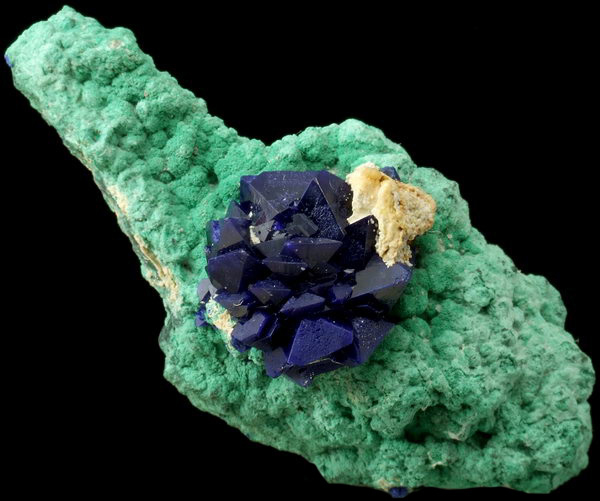 Azurite on Malachite from Oumjrane; size: 4.2 cm. Fot. G. Bijak. The view to N from the hill over El-Fecht mine. The dupms in the foreground. Fot. J. Gajowniczek. El-Fecht workings. Fot. J. Gajowniczek. Tomek coming out from the underground, El-Fecht. Fot. J. Gajowniczek. 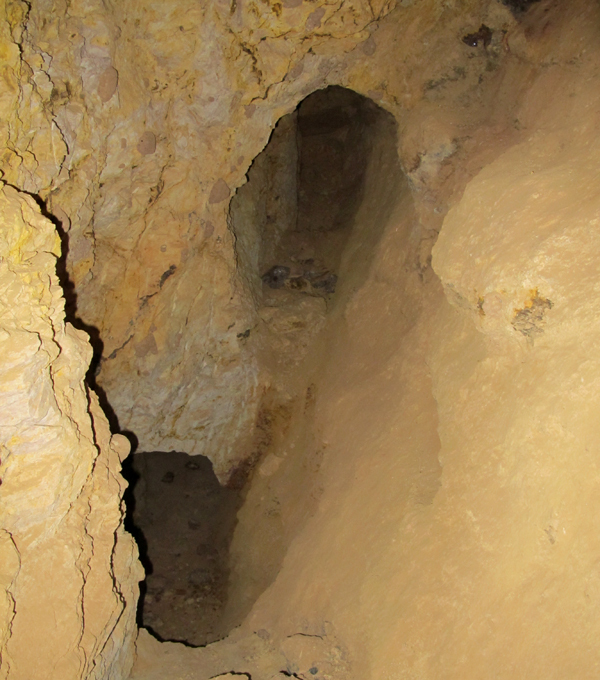 Underground workings of El-Fecht mine. Fot. J. Gajowniczek. 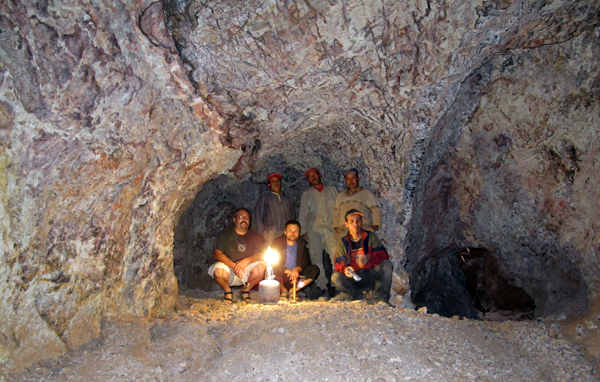 Tomek, Krzysztof and the miners in El-Fecht mine. Fot. J. Gajowniczek. The miners from El-Fecht mine. Fot. J. Gajowniczek. 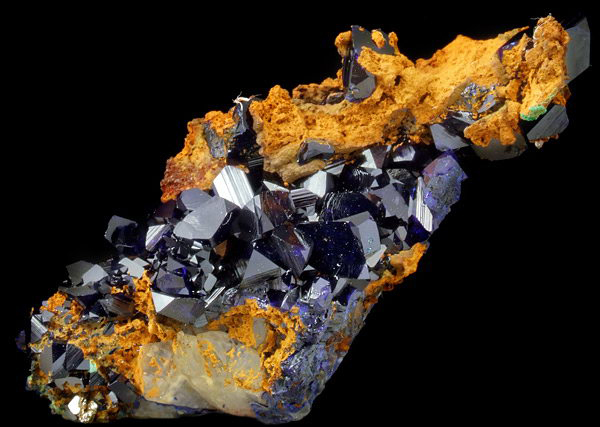 Azurite, El-Fecht mine. Fot. J. Gajowniczek. Azurite from El-Fecht; size 1.8 cm. Fot. G. Bijak. 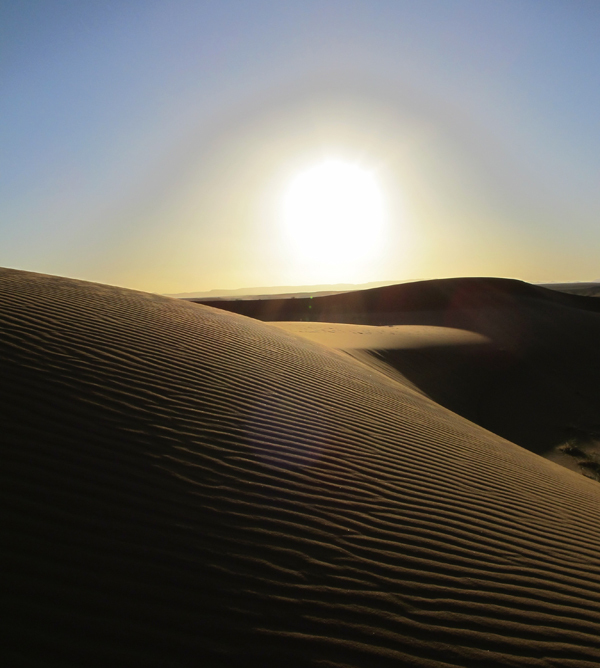 The desert, near El-Fecht workings. Fot. J. Gajowniczek. Tomek - Berber. Fot. J. Gajowniczek. 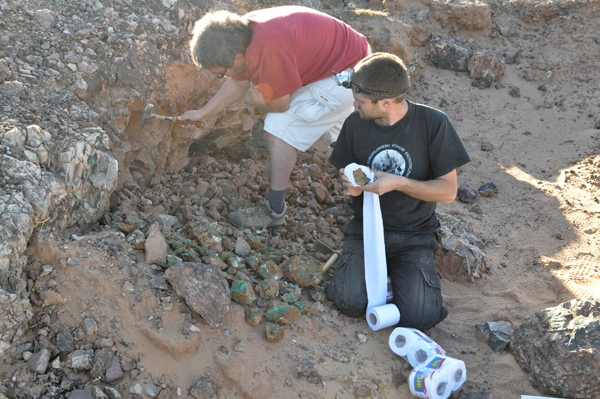 Tomek collecting syderites, Alnif area. Fot. J. Gajowniczek. 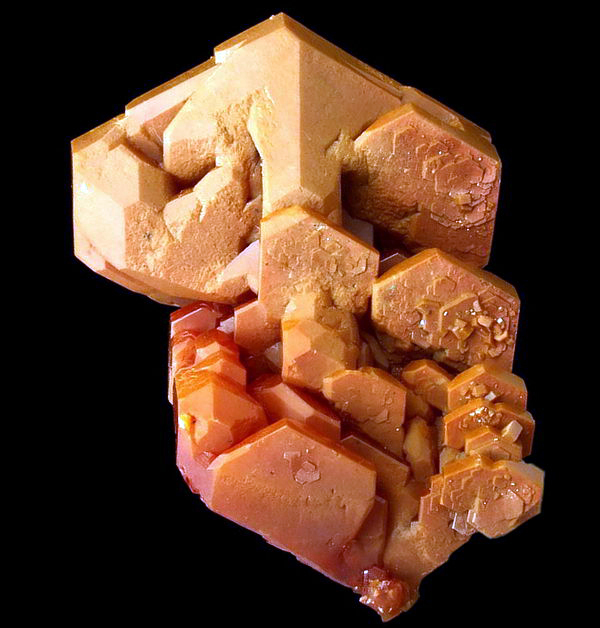 Self collected syderite specimen, Alnif area. Fot. J. Gajowniczek. 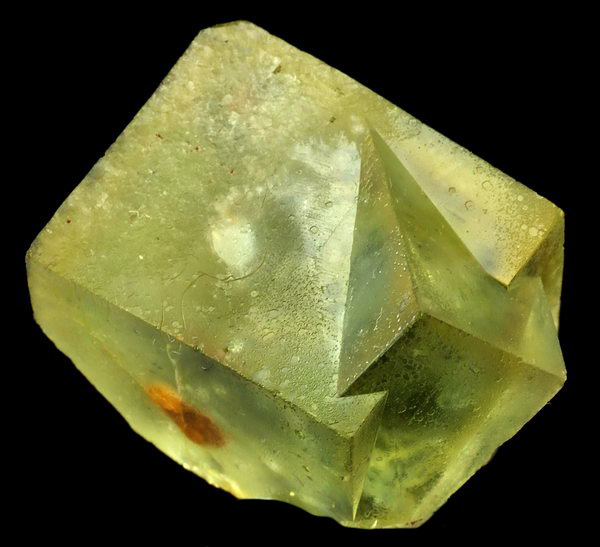 Syderite from Alnif area, size : 2,2 cm Fot. J. Gajowniczek. 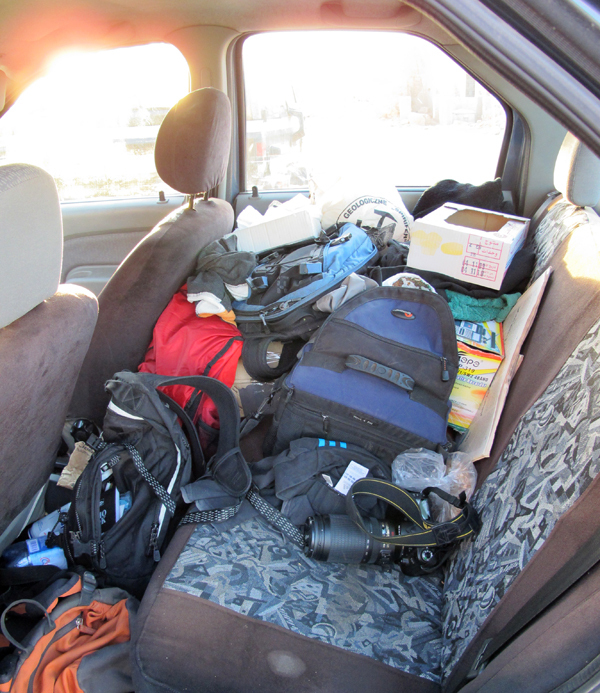 The back seats of our car - the trunk was full of rocks and minerals. I had less space to sit everyday. Fot. J. Gajowniczek. 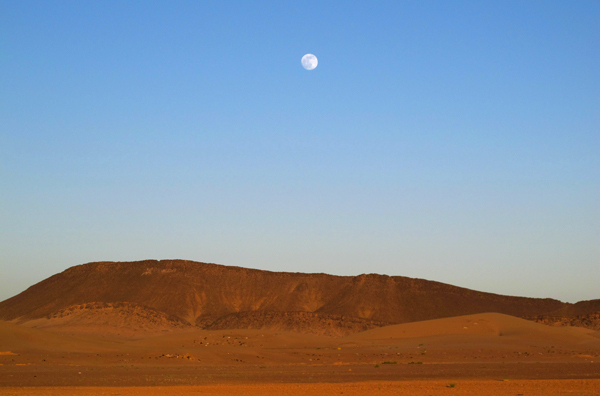 Moonrise on the desert. Fot. J. Gajowniczek. 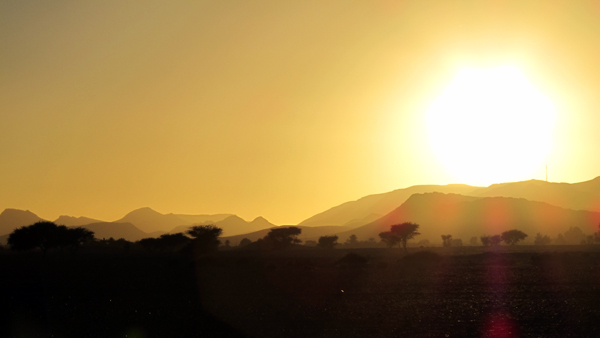 Sunset on the desert. Fot. J. Gajowniczek. Jebel Issimour Mt. 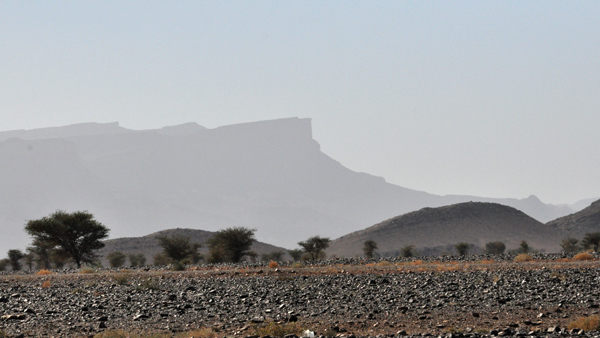 The majority of Moroccan trilobites come from a very long layer that stretches out at the base of this mountain. Fot. J. Gajowniczek. 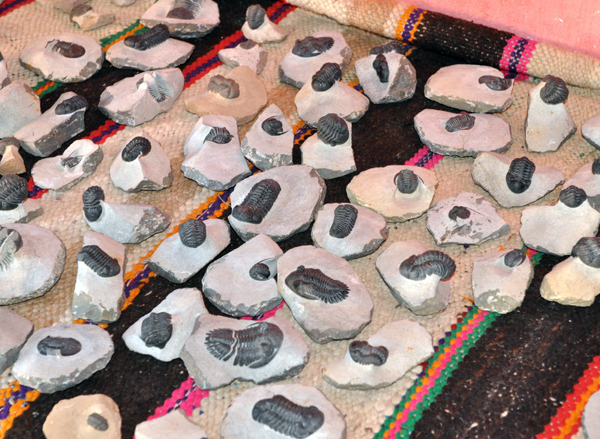 Trilobites from Jebel Issimour (see the the photo above). Fot. J. Gajowniczek. Our friend Ben. 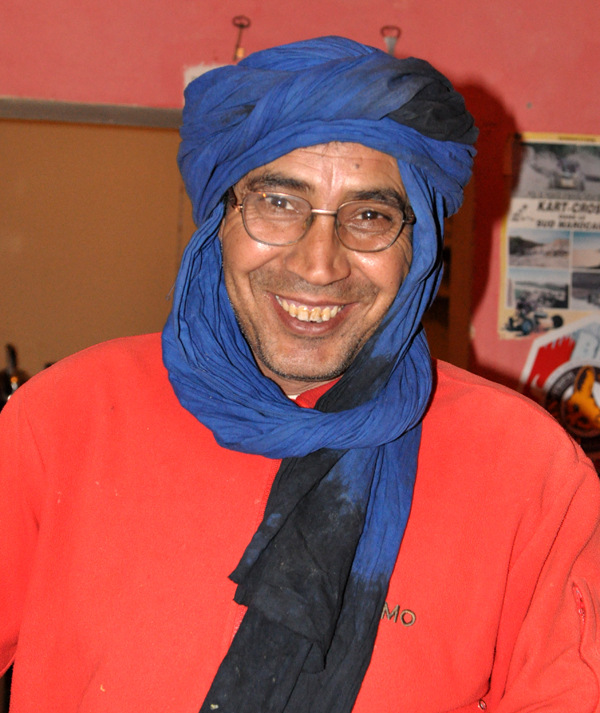 We spent the New Year`s Eve in his inn "Tomboctou" in Mcissi. Fot. J. Gajowniczek. 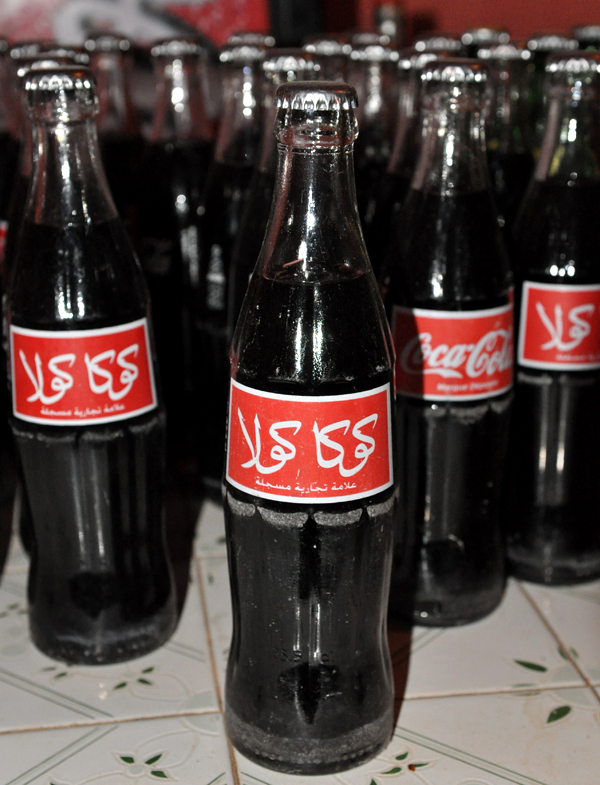 The Arabic version of Coke. Fot. J. Gajowniczek. 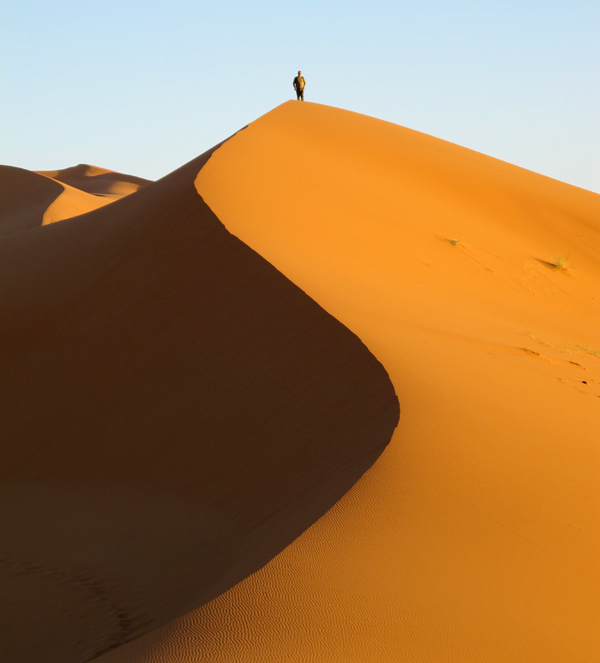 Asia and Erg Chebbi - large dunes formed by wind-blown sand — reach up to 150 meters high, and form a composite erg 22 km long and 5 km wide. Fot. T. Praszkier. 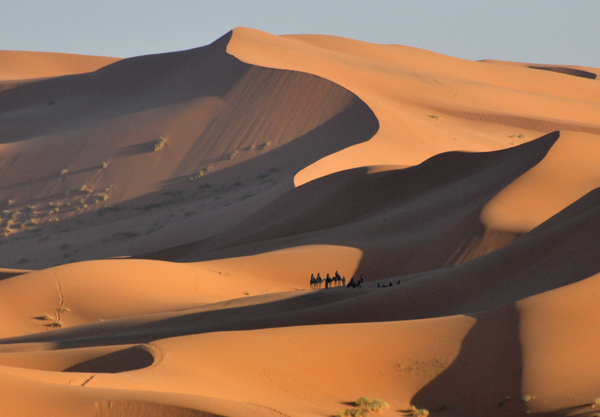 Erg Chebbi - large dunes formed by wind-blown sand — reach up to 150 meters high, and form a composite erg 22 km long and 5 km wide. Fot. T. Praszkier. 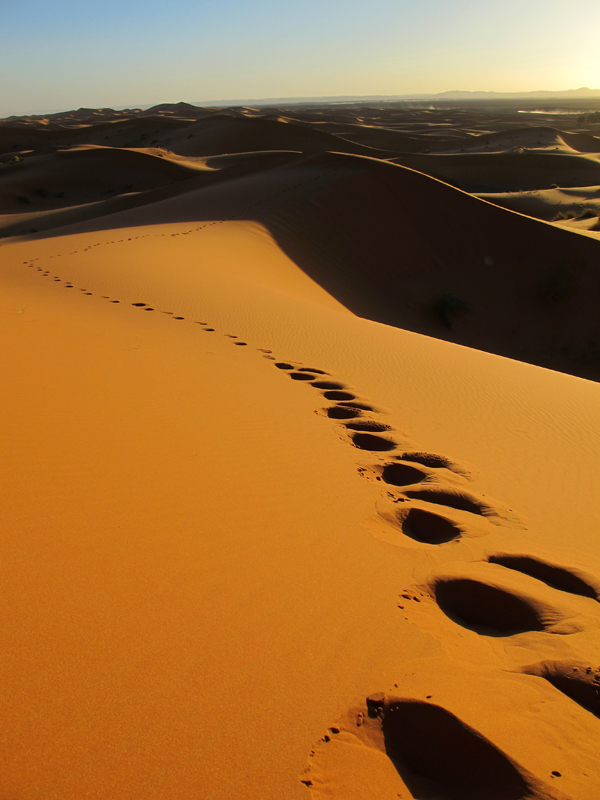 Erg Chebbi - large dunes formed by wind-blown sand — reach up to 150 meters high, and form a composite erg 22 km long and 5 km wide. Fot. J. Gajowniczek. 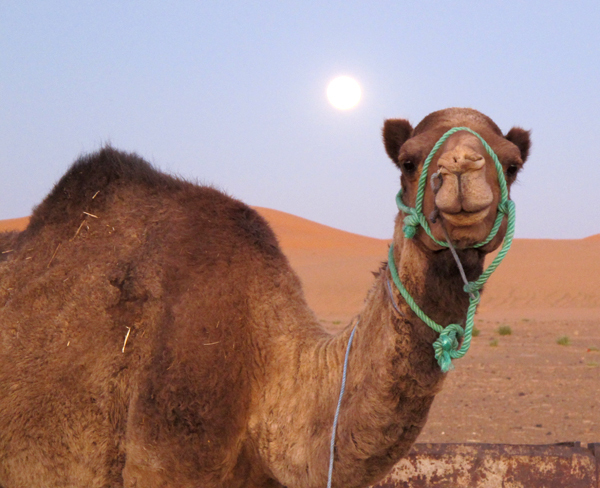 Camel, Erg Chebbi. Fot. J. Gajowniczek. 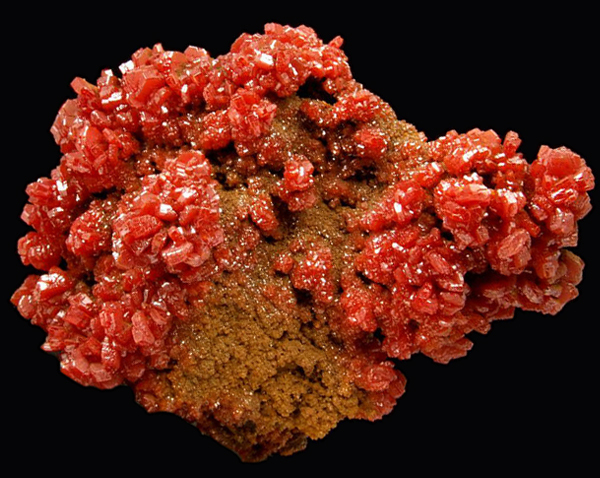 Big vanadinite from the new find in Taouz, size 7 cm. Fot. G. Bijak. 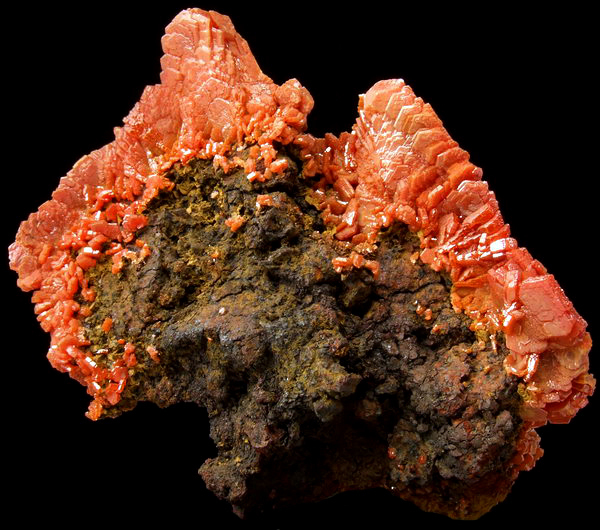 Other habit of vanadinite from the new find in Taouz, size 6 cm. Fot. G. Bijak. 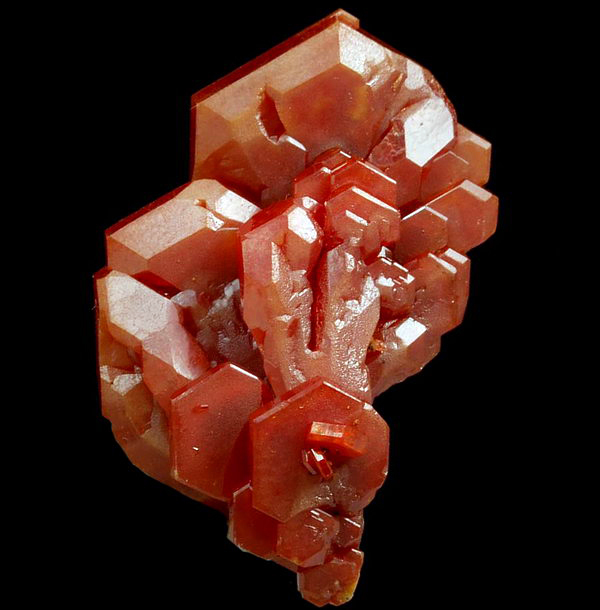 Unusual "curtain like" habit of vanadinite from the new find in Taouz, size 7 cm. Fot. G. Bijak. 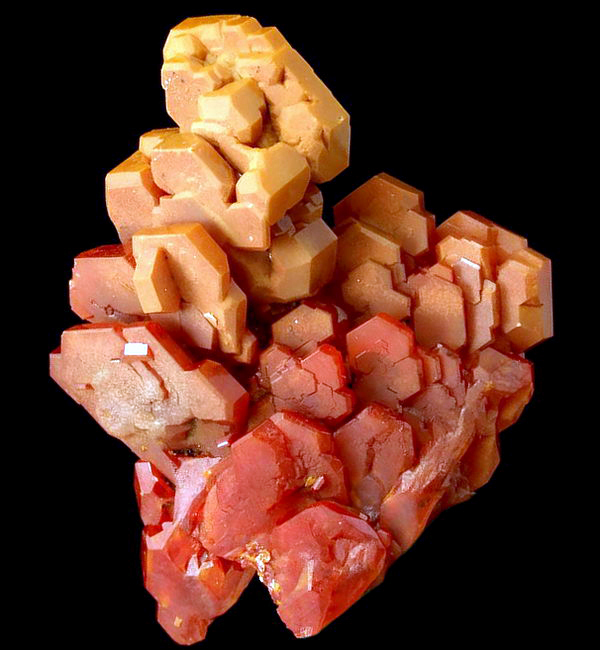 Parallel growth crystals of vanadinite from the new find in Taouz, size 3.2 cm. Fot. G. Bijak. 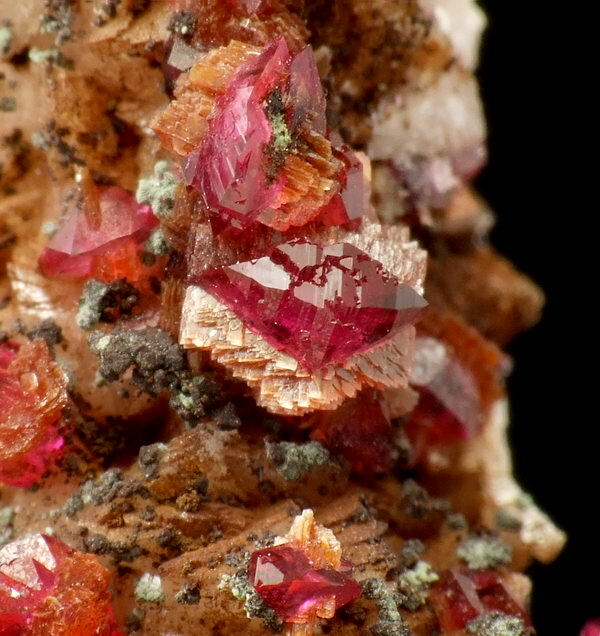 Parallel growth crystals of vanadinite from the new find in Taouz, size 2.2 cm. Fot. G. Bijak. 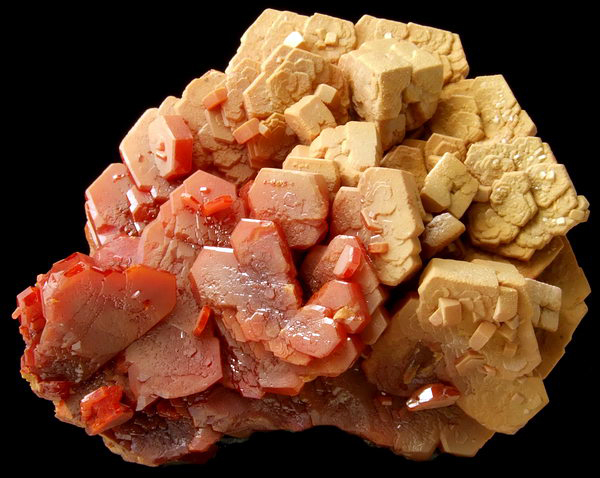 Parallel growth crystals of vanadinite from the new find in Taouz, size 4.6 cm. Fot. G. Bijak. 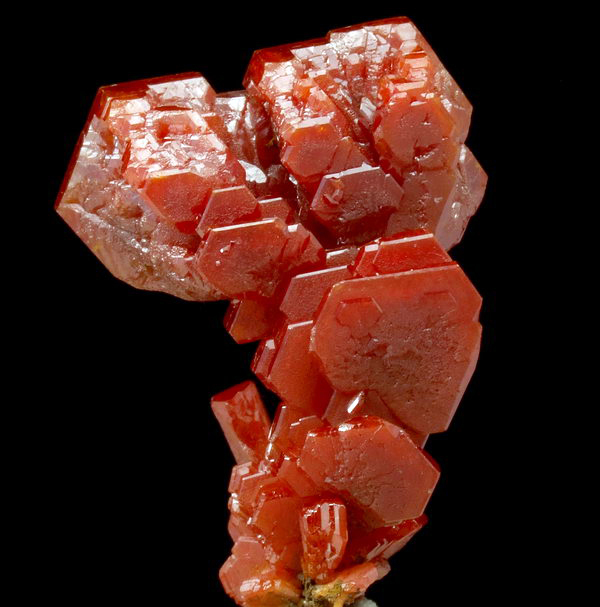 Vanadinite from the new find in Taouz, size 4.2 cm. Fot. G. Bijak. 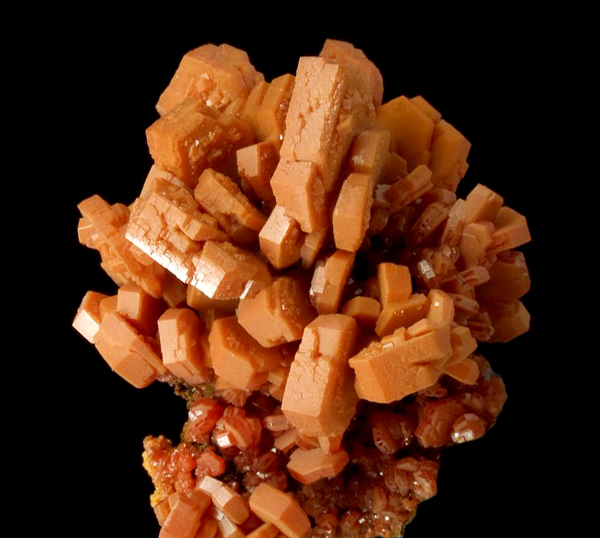 Parallel growth crystals of vanadinite from the new find in Taouz, size 4.5 cm. Fot. G. Bijak. 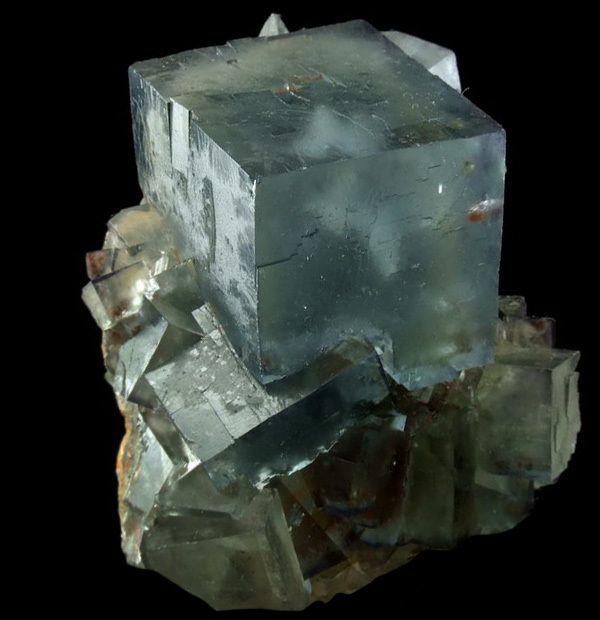 Fluorite from Jorf with nice phantom, size 3.5 cm. Fot. G. Bijak. 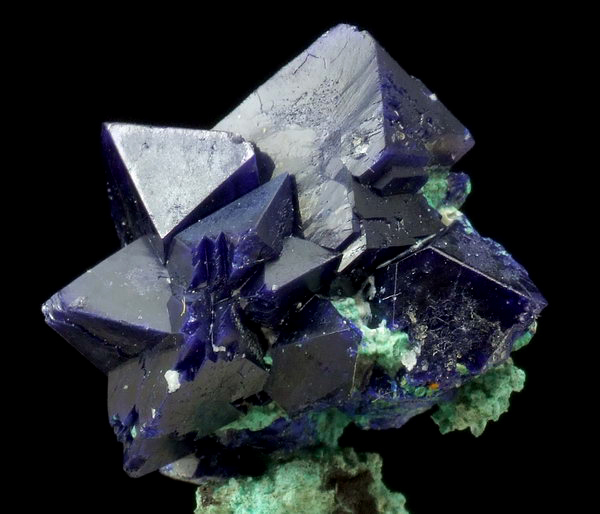 Penetration twin of fluorite from Jorf, crystal size 2.7 cm. Fot. G. Bijak. 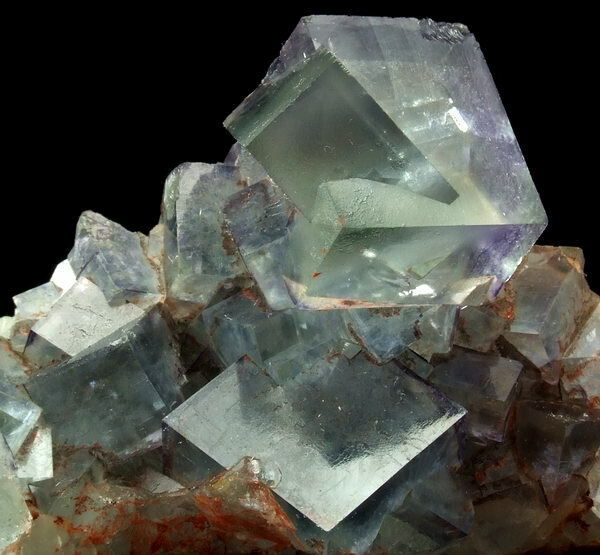 Fluorite from Jorf, crystal size 2.8 cm. Fot. G. Bijak. 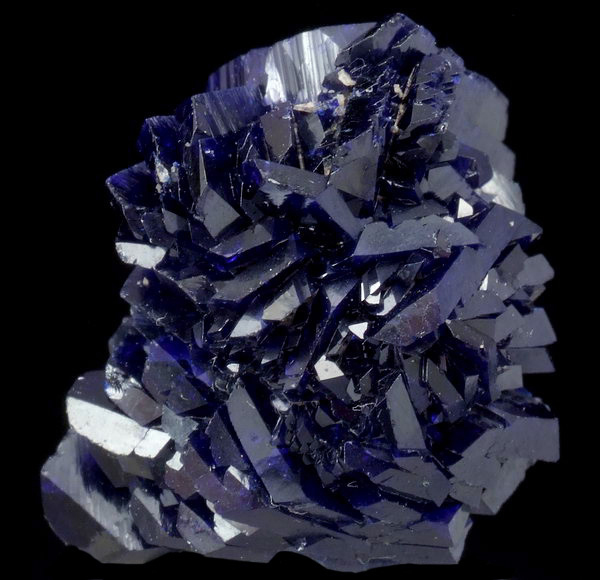 Fluorite from Jorf, crystal size 1.6 cm. Fot. G. Bijak. 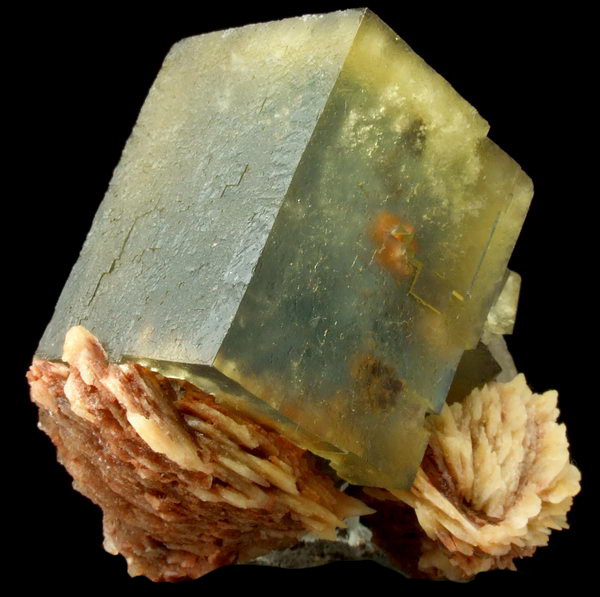 Fluorite and Barite from Jorf, crystal size 3.4 cm. Fot. G. Bijak. A traditional village, on the way to Todra Gorge. Fot. J. Gajowniczek. 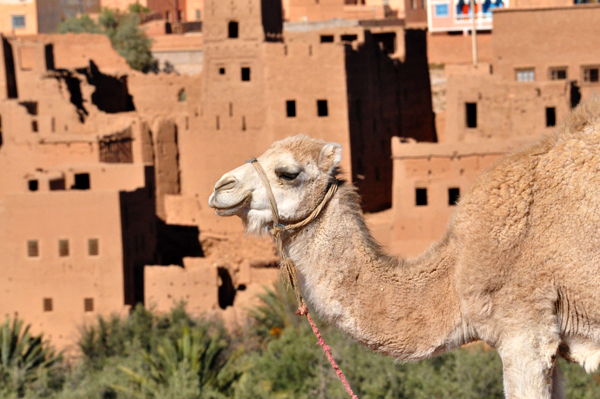 Camel and a traditional village in the background, on the way to Todra Gorge. Fot. J. Gajowniczek. Asia in the Todra Gogre. 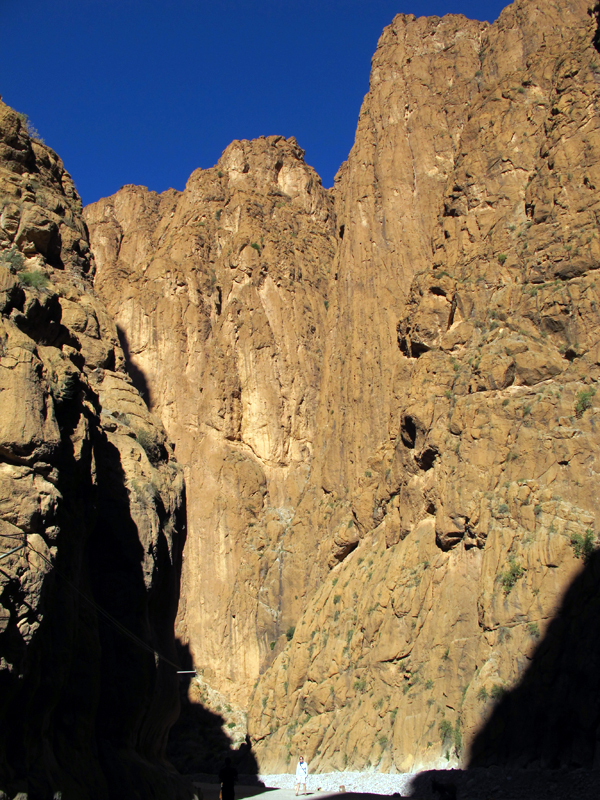 Todra River has carved out cliff-sided canyon on its final 40 km through the mountains. It is a very popular tourist attraction. Fot. J. Gajowniczek. Beautiful View in the Atlas Mts, on the way to Imilchil. Fot. J. Gajowniczek. 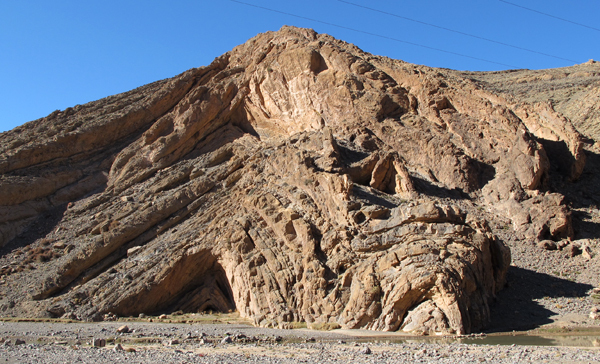 Spectacular folds in the sedimentary rocks, Imilchil area. Fot. J. Gajowniczek.